There's no I in team, but supposedly there are three in air conditioner. I offered to help carry it upstairs. Dave ignored me and carried it up alone. I opened the storm window. He positioned it for fit and then set it on the ottoman to attach the side and top extra parts. “I need a drill,” he said, not moving. “Want me to get it?” I offered. I went down the basement and poked around the workbench. I saw the drill but the driver? There were a couple of possibilities. One thing that looked almost exactly like the drill, one smaller red thing that I thought maybe didn’t work anymore. Or had we replaced that one with this one? The workbench area is a mess. Plastic bins everywhere, from the condo when we kept things meticulously labeled and stacked, but now half empty, lids gone, things taken out and not returned. Like water, junk seeks its own level. I grabbed a new-looking drill bit case and carried it with the drill and the possible driver upstairs. “Perfect,” said Dave. 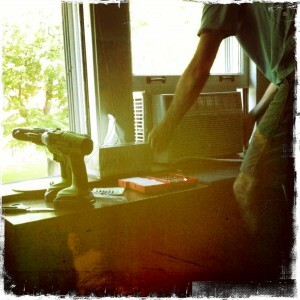 I sat on the bed while he did some stuff with the drill or the driver. Then he put the air conditioner back in the window. I stood up for that. “I need a level,” he said. “I need to make sure it drains,” he said. “Well. I’m not going back down,” I said. I brought up an extension cord. I put some clothes away. He gave me the manual and said maybe I should read about the remote. He put in some insulation and I read about the remote. 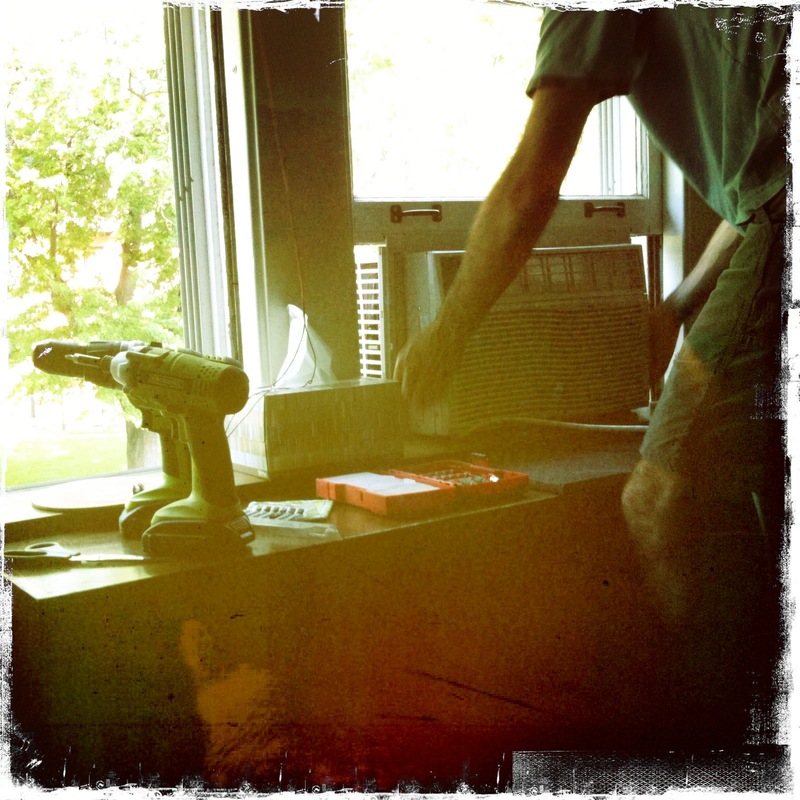 He said something about nesting birds and replacing the accordion things with Plexiglas. “That’s what I did at my old house,” he said. Yawn. He turned on the air conditioner and I controlled it with my remote. Project complete. Wow, Dave is an HVAC expert. I wonder if he knows how to recharge a window unit. We have one that is slowly becoming less and less efficient. I know how that goes on the project front though- I never manage to bring everything I need on the first trip. Hope you guys stay cool today. It’s going to be tough, even with an AC. First of all, there are three Is in “air conditioner”. Second: I distinctly remember MT returning with both the level and the extension cord. One trip. I do however admit that I didn’t end up needing the level, though I pretended to use it. Also: we need to add insulation to the shopping list along with a filter for the big A/C unit. Sorry, don’t know about recharging window units, but I’m sure it’s possible. Seems like they must sell a home refrigerant recharge kit. I’ll add the eyeballs and tape later.